Ski de Femme & Rocky Valley Rush Report | Birkebeiner Nordic Ski Club Inc. 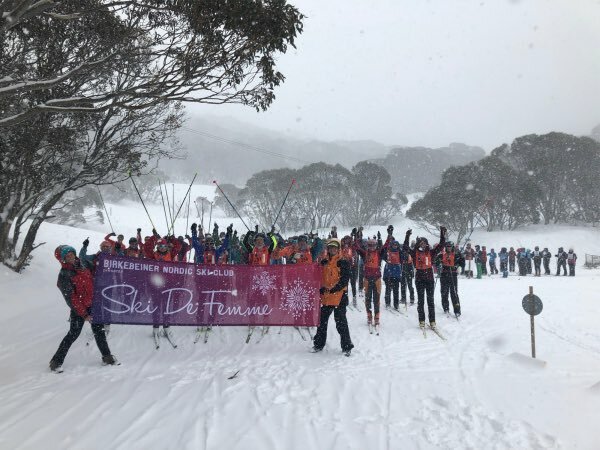 The 25th Ski de Femme held on Saturday had 145 women register, (Could be a record!) so along with coaches and helpers, about 160 hardy women made it to the Nordic Bowl. The organisers did a fabulous job pulling it all together in fairly tough conditions. A great team of coaches and helpers worked really hard, putting up the tent, preparing the refreshments, taking the race entries, giving out the bibs, selecting the spot prize winners doing the presentations then packing everything up afterwards. And of course the 15 volunteer coaches were appreciated for their tips and encouragement. Helen L’Huillier who started Ski de Femme along with Jenny Van Der Ploeg generously turned up again to help! 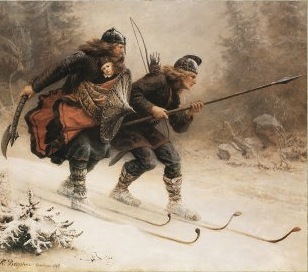 Marg Jowitt loaded the skidoo with the equipment and food and drink at the clubhouse, drove it up to the bowl, chose and marked the course collected the markers afterwards, packed the skidoo again drove it back to the clubhouse and unpacked everything before putting the skidoo away in the shed. Amazing, seeing she hadn’t been on the machine yet this year. The hot tea, scones and jam & cream after the instruction clinics were welcomed before the fun race, and the post race brownies supplied by BRAZEN BROWNIES at the finish line a hit! Plenty of Spot Prizes donated by local business were rewards for donning a bib and skiing or racing the 1, 2 or 4 km loop. Special thanks to our major supporters FCRM, YMCA Cross Country Ski Centre and Brazen Brownies. Other lucky women won sport massages (Impact Massage Mt Beauty) a Sassy Road voucher, Sweet Water beer packs, Hoppet wine, coffee and treats vouchers from Wonderland EMPORIUM, the Mt Beauty Bakery and the Rose Garden Cafe. Thanks to everyone. All in all it was a fantastic effort by our club members. Results of the 2018 Rocky Valley Rush & Sun Valley Ramble held today Sunday 12th August. Click [HERE] to view. Thanks to Michal Trnka (Alpine Timing) and his assistant Bill Little for timing the race.